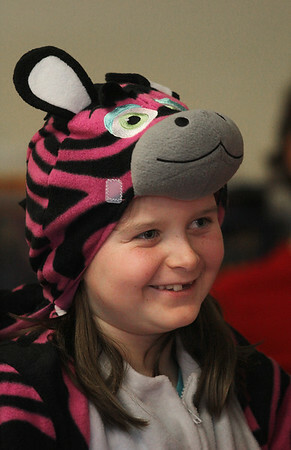 Third grader Sydney Bouchie listens to a story Monday during Dr. Seuss Day festivities at West Parish Elementary School in Gloucester. Monday was the 111th birthday of the beloved children's author Theodor Geisel, known as Dr. Seuss. To celebrate, students and faculty wore costumes and pajamas and listened to stories read by guest readers.